← Le Cupole, Tenuta del Trinoro,Toscana IGT, Italia, 2005, 14.5% abv. I confess that even I get a little overwhelmed by the sheer volume of choice offered at some wine stores. And I often shake my head when trying to figure out how they’ve decided to organize the styles, grapes, quality levels and regions represented. Recently when I visited the football field sized Total Wine + More in Vegas, I turned in circles more than a few times. But my tenacity was rewarded when I found this bottle from biodynamic Maysara in Oregon’s McMinnville AVA. The Arsheen Pinot Gris is very pale lemon with aromas of stonefruit, pink grapefruit and dried herb. Its palate makes you sit up and take notice. Dry with juicy acidity, the flavours are deeply fruity and layered, showing ripe pear, nectarine and apricot, grapefruit, lemon verbena and tarragon on top of a rocky frame with not a tinge of bitterness. Fresh, harmonious, absolutely delicious and hard to stop drinking – WSET Very Good. 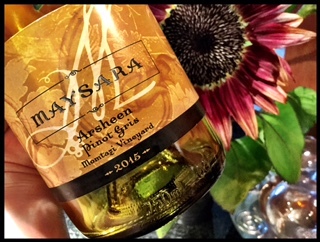 This entry was posted in Oregon, Pinot Gris, WHITE and tagged 12.5% abv, 2015, Arsheen, maysara, Maysara Winery, mcminnville AVA, momtazi vineyard, oregon, pinot gris, white wine, Willamette Valley. Bookmark the permalink.